There are many blog post and research articles available to tell you the importance of fueling post run – what to eat and when. While after some runs we’d rather be showering, or lying in bed, fueling is key for a speedy recovery. This post won’t tell you what to eat after you’ve drained the tank – instead, here are my three favourite Toronto restaurants to hit up for post long run #bRUNch! 3. Sadie’s Diner and Juice Bar. Located at 504 Adelaide St W. Sadie’s Diner and Juice Bar offers an extensive menu of “comfort foods, updated.” The usual omelets, pancakes, and French toast are featured on the breakfast menu along with items such as tofu scramble, which is scrambled tofu served with home fries, veggie bacon or veggie sausage and toast, as well as Huevos Rancheros, which is two eggs over easy on corn tortillas with salsa, refried beans, guacamole & cheddar cheese (there is also a tofu version of this dish). The staff are pleasant, and atmosphere is quaint (be sure to check out their Pez wall), I do suggest bringing cash, as when I was there the debit machine was down and our whole group and to add on to our run to find some cash to pay. I recommend: The Huevos Rancheros with scrambled eggs. 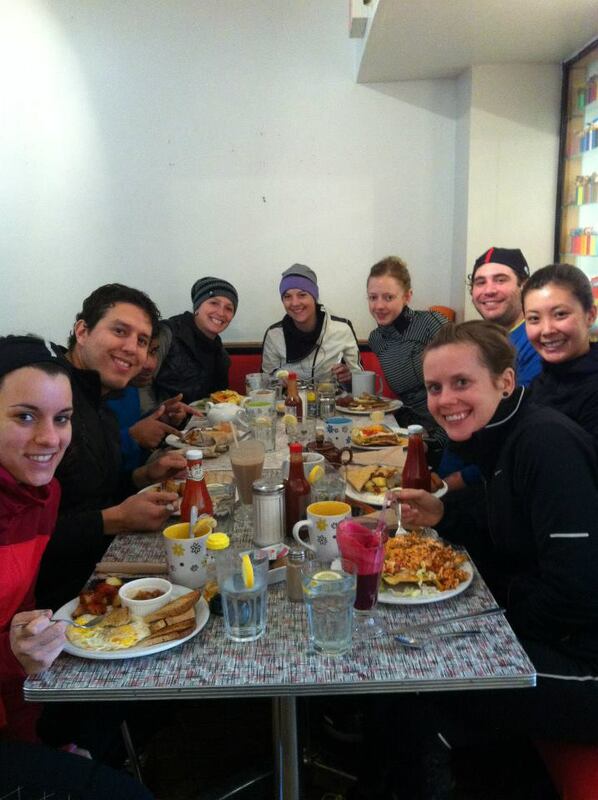 Located at the Thompson Hotel, 550 Wellington Street W, Thompson Diner, although the most expensive brunch spot on the list, offers a variety of post run fueling options in both food and liquid form. You’ll find classic items on the menu including omelets, breakfast burritos, pancakes, and oatmeal, but you’ll also find items such as their Breakfast Poutine, made of fries, chopped turkey sausage, poached egg, hollandaise sauce and gravy, or their famous Brunch Burger, which is a beef burger with a fried egg, bacon and melted cheddar served on a powdered donut. The service here is what you’d expect from the Thompson Hotel (friendly and professional) and chances are pretty good that you might see a film star or professional athlete dining at the booth next to you. Open 24 hours. I recommend: The buttermilk pancake with your choice of banana. blueberry, or chocolate filling. Located at 130 Spadina Ave, What A Bagel, is a dine in and take out bakery and eatery. Their menu contains a variety of items served is sizes perfect for someone who has just rocked a long training run (they’re big with lots of sides). You can order omelets, breakfast sandwiches, a variety of specialty eggs including benedict florentine and benedict with salmon, French toast/pancakes/waffles, fresh fruit bowels you design, fresh bagels still warm or my favourite chocolate croissants hot from the oven (I’m pretty sure these are the best in Toronto – if you know of better please share!). The seating exists in a variety of configurations so they can support run clubs of larger sizes, just be sure to arrive early, because it gets packed! Weekend hours: 8am-5pm. I recommend: Making your own custom 3 egg omelet. Get it the way you want and it’s served with sides galore! And of course you need a chocolate croissant on the side! Bonus: Why not host your own brunch? Have your tribe each contribute their favourite items and snack and stretch in the comfort of your own home! Where do you love to eat post run? Share it in the comments!